He makes coffee. She bakes pastries. You get to enjoy the delicious results. 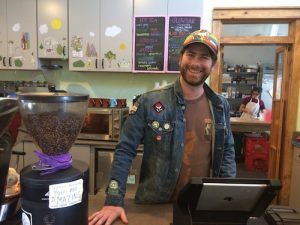 Jonathan and Megan Walker, owners of The Station Coffee Shop and Bakery, admit to having a crush on their Mid-City building for years and just this year opened the doors for the new shop. The Station stands as a purple highlight in the neighborhood and is already a staple for many local residents. We sat down with Jonathan Walker to hear about his experience as a freshly-brewed entrepreneur. What ignited the spark for you to start your business? I’ve been working in coffee since I graduated college, which is pretty common for people who graduate with an English degree. And I love it!My wife always wanted to be a baker and used to work at Angelo Brocato’s. We live about four blocks away and have always loved this building. It was sort of a dream of ours to buy it and open shop.